Four years ago I founded BigChange with a vision to harness the benefits of Mobile Workforce Management technology with a simple, powerful platform that would be within the reach of businesses of any size. I’m proud to say that we now have over 10,000 subscribers across the UK, France, Spain, Scandinavia and Australia. BigChange grew by over 100% this year and sales should reach £4m. I also want to recognise the achievements of our incredible team; we now have over 50 employees who are truly passionate about delivering a world class service 365 days a year. BigChange is the winner of KPMG’s prestigious Best Mobile Startup 2017 competition for the Northern Region. Our team pitched against some of the most disruptive Mobile Technology players to win this award. We’ll be pitching at Mobile World Congress in Barcelona next year at the Grand Final. We also won the B2B award at the 2016 Big Chip Digital awards. We’ve just launched an all-new version of the JobWatch Android Mobile app. Designed to be Slicker, Faster and Smarter, the new re-imagined app brings new on-the-go features including CRM, the ability to access historical jobs and worksheets, holiday + absence management plus an all new stock and equipment section. It’s the perfect productivity partner for your drivers, mobile technicians and service teams as well as for field based salespeople and account managers. Another new exciting addition for 2017 is BigChange Analytics, a business intelligence Application. There’s three different modules available including Financial, Productivity and Fleet + Risk Management. We now work with over 60 industry sectors. Our team of industry specialists now work across Service, Transport & Logistics, Construction, Waste, Public Sector and Equipment Hire. Among the 200 new customers that made a ‘Big Change’ this year are John Deere, Hargreaves Aggregates, Elddis Transport, Eurofins, Kingspan, Blue Machinery, Buy-It Direct and Sutton & East Surrey Water. 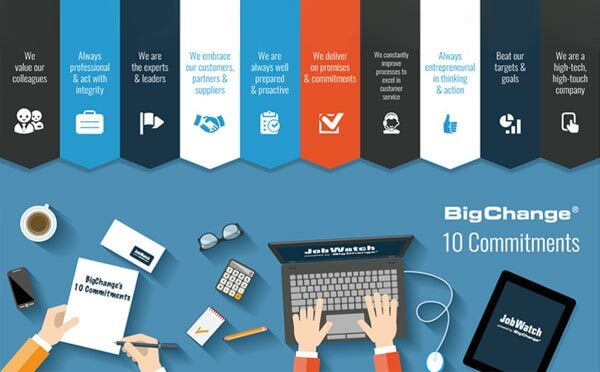 We continue to add new integrations so that JobWatch works with other back-office ERP and accounting systems. You can now connect JobWatch to Sage (Line 50 and 200), Xero Accounting, Quickbooks, Microsoft Dynamics NAV, SAP Business One, MCS Rental Management and Sterling Software. I’d like to wish you good health, happiness and business success in the coming year.